The Centre for Solar Energy Research (CSER) is part of Swansea University’s College of Engineering and is based at the OpTIC Centre, St. Asaph. 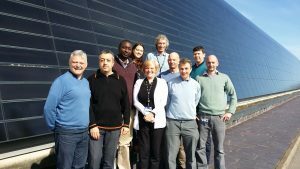 CSER is the project lead for the £7.2M Solar Photovoltaic Academic Research Consortium (SPARC II). This Welsh European Funding Office SO1.1 operation provides the underpinning funding for a collaboration of 6 research teams across the Universities of Swansea, Aberystwyth and Bangor. CSER collaborates on renewable energy R & D both within the UK and internationally and has a strong track record in researching novel solar photovoltaic (PV) materials and devices. CSER focuses its research towards commercial applications with several of CSER’s previous grant funded projects involving collaborative work with both industrial and academic partners. Through these interactions CSER has gained a world-class reputation in Solar PV and technology transfer. To assist businesses working on any aspect of the renewable energy supply chain, including collaborative research and development, and by offering analytical services and training.